The 2014 Niceville Community Christmas Festival will be held on Saturday, December 6, 2014, 5 p.m. to 9 p.m., at the Niceville Civic Center Complex. 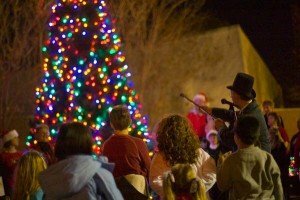 The community is invited to enjoy a festive evening of food, fun and fellowship at the annual event, which will feature the lighting of the community Christmas Tree, a number of school choirs, craft-making, a sleigh hay ride, Christmas scenes and characters, Santa Claus, food, beverages, and craft and gift vendors. Children will have the opportunity to visit with Santa, make free crafts, and write a letter to Santa at the Niceville North Pole Post Office. Visit the Council chambers where there will be scenes set up with different characters to take pictures with your children, so be sure to bring a camera! Details and schedule to come. Check back soon. No vehicles are allowed inside the City Complex for this evening so our little ones are safe, so please park at the Softball complex or across the road at Ruckel Middle School. The Niceville Civic Center Compex is located at 208 N. Partin Drive. Mayor Randall Wise leads the lighting of the Community Christmas Tree at the Niceville Civic Center Complex.